Which Way to Face an S-Hook? Trust Nautica to not be able to go completely casual in casual display. 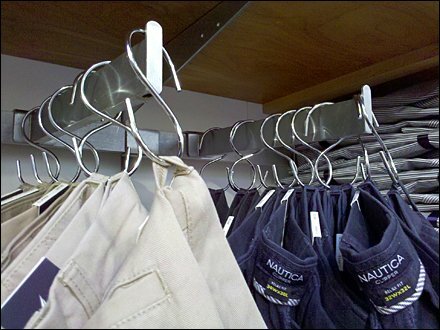 Here jeans informally hung, are made slightly more formal with S-Hook intermediaries. But Which Way to Face an S-Hook? 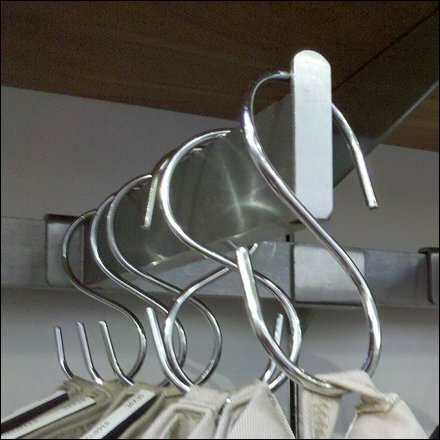 My personal OCD was sorely tempted to face all the S-hooks identically, and the display would have benefited, but which direction do you face an S-hook? Luckily as in “Star Trek” I am governed by a retail non-interference Prime Directive. So instead I rushed home to make sure my shower curtain hooks were all aligned identically. Then I was at peace. “ Asymmetrical Display Pinterest Board ” for a visual summary. “ Asymmetrical Display Index Page ” for all resources and links.